Comments: The reissue differs in several ways from the original, most notably is the solid state rectifier, printed circuit board and hardwired reverb cables. Hey, is this amp still available? I have been usung the ’63 Vibroverb Reissue ever sine I bought it new, in 1992. Never a problem mechanically.. I have been using all Groove Tubes for all the preamp tubes, since it was still almost new. And the 6L6s are the older Svetlana “Winged ‘C'” power tubes. All of the original tubes were Chinese, and some people gave them bad reviews, so I just replaced them all. The hugest improvement on sound was when I put a pair of new 10 inch Eminence 1028-K, [ALNICO], speakers in it… It was as if I took a thick wool blanket off it. It is the perfect amp for me. It sounds really good either at very low volumes or at very high volumes. I am always getting compliments on it’s TONE, when playing out with my 50s-60s R&R Band….. I managed to find one of these new back in 1991 with the 2 X 10 Oxfords. Great little combo and very reliable. The only mod I made was to swap out the Oxfords for Jensens, made a huge difference in brighter tone. 35 watts may be an understatement in my opinion, this baby is Loud ! I put in 2 Weber 10A125,s and NOS tubes. Put in a bias pot and now it,s a tone monster! Takes pedals well. Plenty loud enough, too. How did you install the bias pot? Did you just replace R59 or 58, or did you add a pot and replace one of the resistors. I’ve been looking for some instruction to do that but haven’t found any. It’s a great amp with wonderful tone and plenty of power. Always works and sounds great. Had the tubes replaced with American ones a few years ago which made it even better. Always loved the Fender “Bell Tone” and this one has never let me down. Previously had a Pre-CBS deluxe and a twin. I’ll put this up against both of those any day. It’s an extremely nice amp, loud enough for smaller gigs. 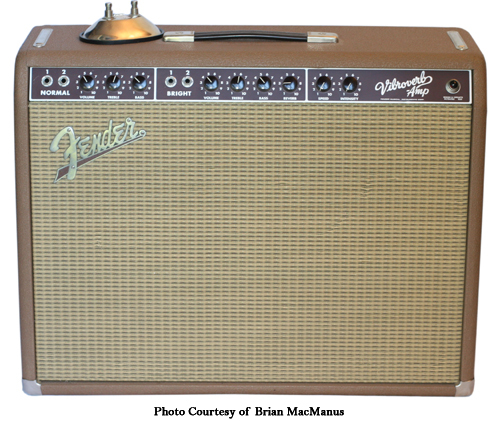 As a benefit, this amp is a real looker, especially with the Fender “flat” logo. My current favorite amp, however, is my Univox 202R. It was in a guy’s trash with five inches of snow on it. I replaced all the tubes, but all it really needed was the two 6973 powers tubes. may be useful to those considering going that route,mine has done very little live work,one show and a couple of rehearsals,doubt many in this condition out there,it is fitted with american valves,think output pair are Sylvania,whatever! they are in good order and well balanced,i also had a chance to pitch this against an original from 63,yes it had a valve rectifier,and totally original,owned by an English legend,i service his amps!! and it was not really much better soundwise,maybe a little warmer,and wound up the GZ34 rectifier sag giving some compression,but what are these selling for 5-6 k bit ripe that btw,fender have made better,being first with reverb the factor.Brown deluxe sounds nicer!! Still a great amp though! !